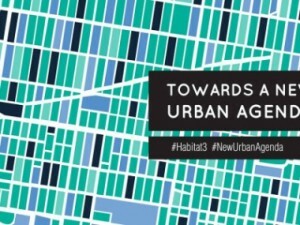 The development and adaptation to new rules for the spatial development of Curaçao are closely linked to the jointly shared resolutions from the Conference Habitat III. From 17 to 20 October last year (2016) this conference took place in the city of Quito in Ecuador. A delegation from the Curaçao government also participated. Every 20 years such a conference is held in an important city in the world. The first conference was held in 1976 in Vancouver, Canada and the second in 1996 in Istanbul, Turkey. It would be the global effort and support for tackling the housing problem, helping to rebuild sustainable urban development and the implementation of a new urban agenda and to provide direction. As a result, the conference led to a concrete, focused, forward-looking and action-oriented result document called "the New Urban Agenda". It concerns the new urban agenda, which is implemented by all Member States. The agenda consists of 175 resolutions, which were also approved by the participating Member States at the conference. The aim is also to place a considerable commitment on the table for all participating countries regarding physical actions that actively support the fight against poverty. And also with regard to being able to realize equal development opportunities among citizens in (new) neighborhoods to be built up. These starting points show that spatial development is not an abstract concept, but that it does intervene and tries to influence the quality of life of ordinary citizens in their daily lives.